Met Elaine in a cute coffee shop in Cork and as she was telling her dream, I was thinking what a fabulous project to work for. She told me how she wanted to work for the health benefit of people, how to coach them to reach a greater state of wellbeing with a holistic approach to wellness, what would be the four pillars of a good health, and as she was counting them, I was thinking: “Uh, I’m bad at that! Really need help at that! What about cakes and cookie?”. But her motivational energy and great looks proved that I can go that way too. 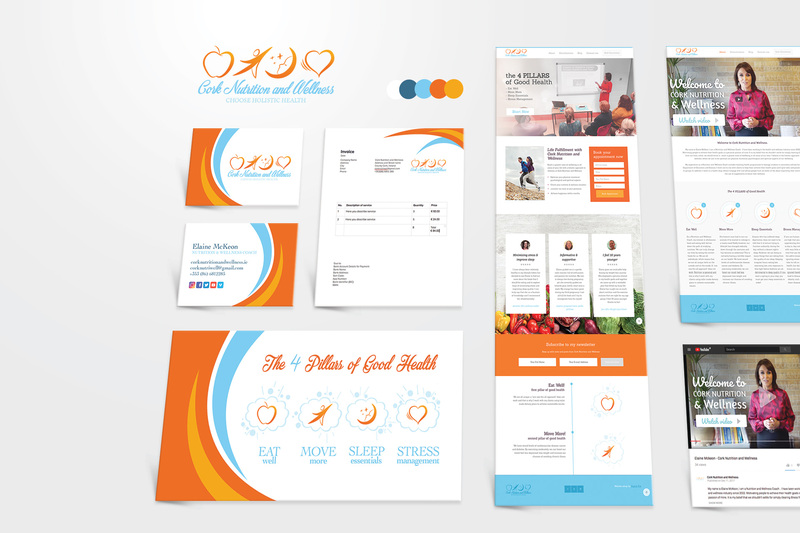 For her Cork Nutrition and Wellness programme, Elaine needed a branding, a website, and an introductory video. We joined forces and established a really good looking visual for her business, designing the logo in such a way to express the four pillars of a good health: 1. Eat Well, 2. Move More, 3. Sleep Essentials, 4. Stress Management. Each pillar had its own graphic, representing the action. After the logo, color scheme and voice was set, I finished also the business card and then proceeded to set up the website. This was done on a reliable WordPress platform with the content management system and responsiveness on all media, connecting it to Twitter, Facebook, Instagram, Google + and Youtube. I’ve also set up the search engine optimization functionality and set it up in Google Business. I really loved the end result, the looks are invigorating and motivational. Elaine also called a cool videographer for her introductory video to be displayed on Youtube. And I finished up the looks in After Effects setting a video front and back design.